Circadian Optics shines when it comes to design elements and effectiveness. This lamp provides both a futuristic, well-designed look and a functional treatment for seasonal affective disorder. Bolder in look and size than other lamps from this manufacturer, I believe that this lamp would be a great upgrade from one of the smaller lamps the company offers. The bright, high-quality light that the lamp puts off is well worth the price point. 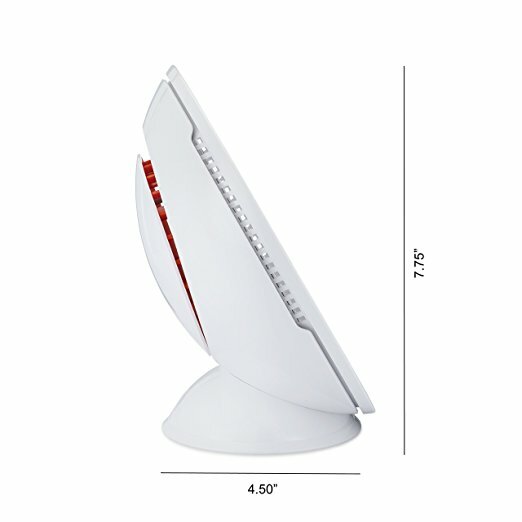 This lamp doesn’t sacrifice quality for design. It is still tremendously effective for treating SAD and other disorders stemming from a lack of natural sunlight. 2019 MODEL UPGRADES | NO MORE DOTS – We have upgraded the light panel to emit a uniform, fully diffused light. IMPROVED ADAPTER – To further improve reliability and durability. (Released Feb 2019). 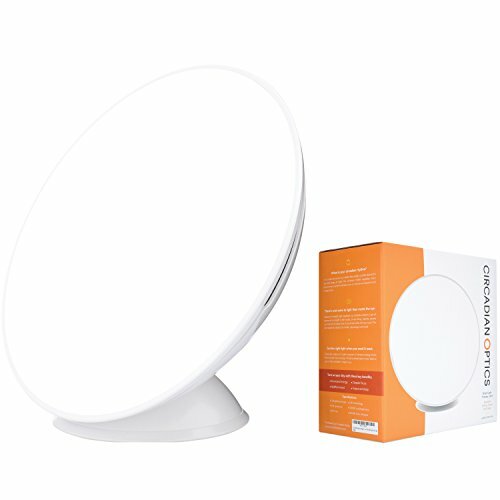 10,000 LUX, 3 LEVEL BRIGHTNESS | The recommended brightness for effective light therapy to help beat the winter blues, circadian sleep disorders, and fatigue. 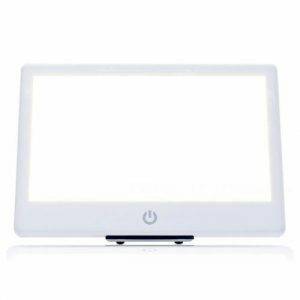 3 one-touch adjustable brightness settings allow for different brightness levels depending on the use environment. FULL-SPECTRUM, WHITE LIGHT, UV FREE | The 5500K color temperature is the color of the noonday sun. This full-spectrum light offers a wider range of colors of the visible spectrum. 50,000 HOUR BULB LIFESPAN, 3 YEAR WARRANTY | LEDs last approximately 50,000 hours, much longer than fluorescent bulbs, meaning no replacing expensive bulbs ever again. Warranty covers lamp and adapter. OUR MOST ORGANIC LAMP | Avoiding sharp angles, this lamp was created with a focus on flowing curves and clean lines. From the front, it projects a simple minimalist aesthetic. From the back, the detail of the venting and subtle use of color add to the sophistication of this lamp. 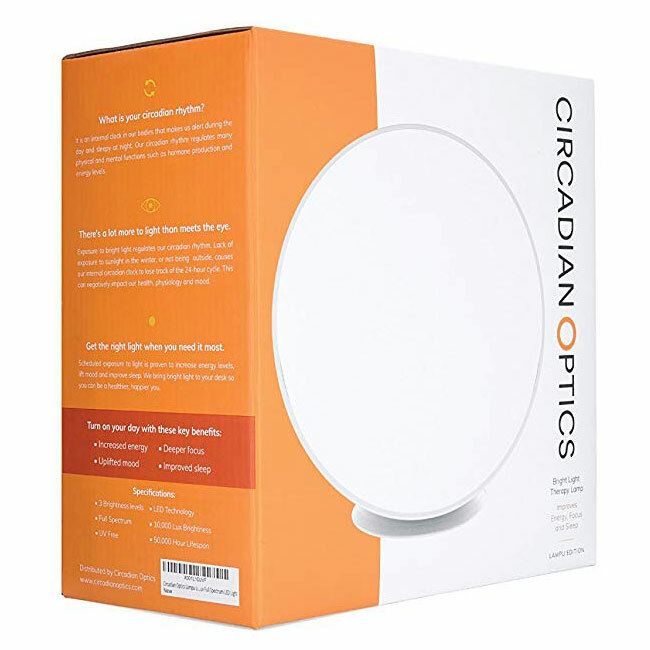 Circadian Optics LLC is based in Minnesota and specializes in light therapy devices that are both functional and pleasant to look at. Out of all the devices we have tested, the Lampu is a top scorer when it comes to the aesthetics. It is a great looking device that really doesn’t have any sort of medical look to it. 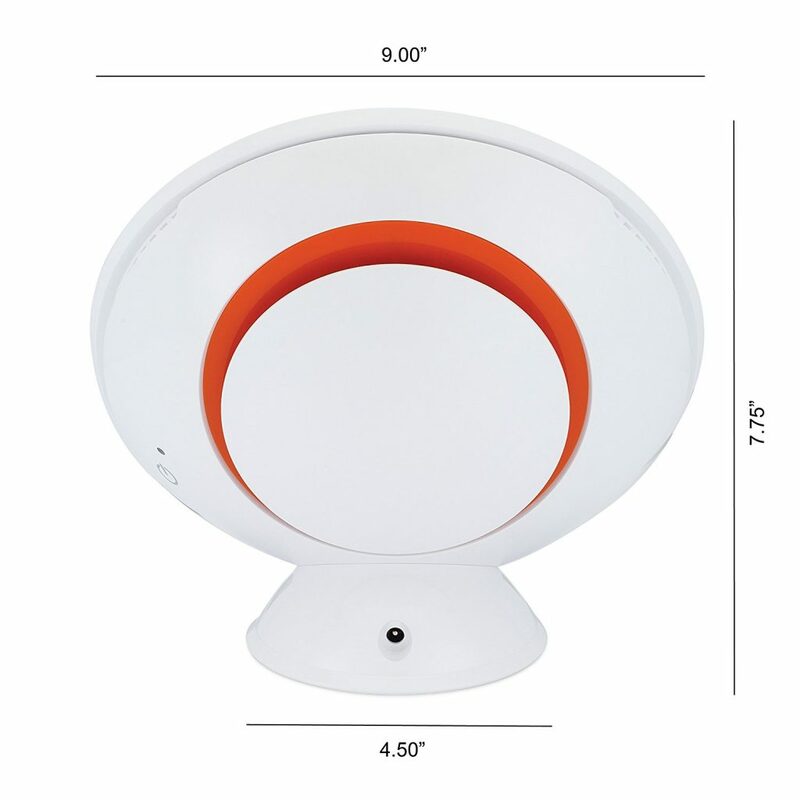 Overall, the design is very stylish – the lamp is white with bright orange accents, including a vent area on the back of the lamp. It is appealing and almost futuristic in its aesthetic. 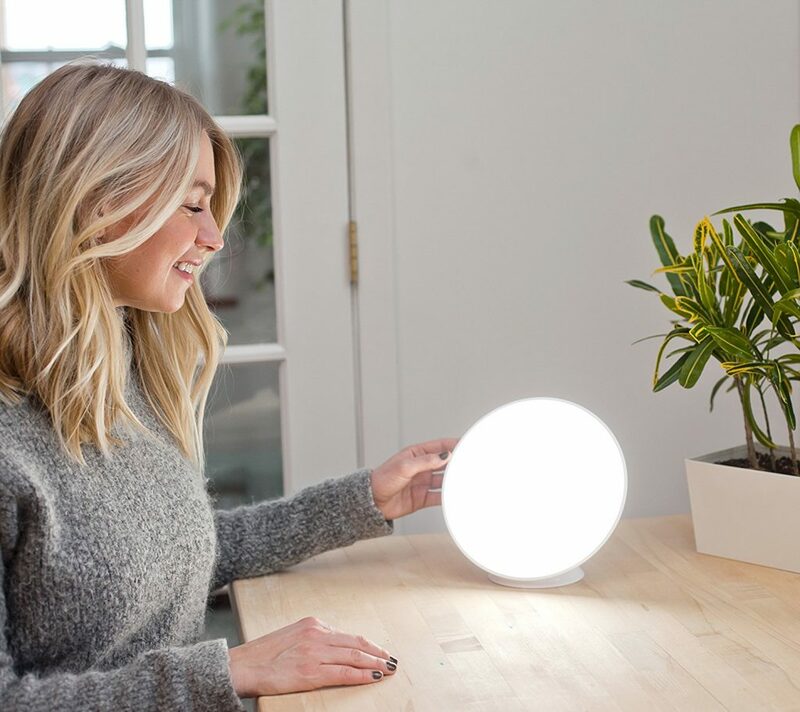 The Lampu lamp is one of the larger lights from Circadian Optics at 5 x 9 x 8 inches, and very lightweight for its size at 2 pounds. The surface of the lamp is circular and about 8.5 inches from top to bottom. This product can be used directly out of the box. The only assembly required is to plug the power cord into the wall and into the unit. The wall adaptor is extremely large and takes up a lot of room. While it uses a single plug, the adaptor is larger enough to cover three individual plugs in my surge protector. If you are limited on space this is something to be mindful of. We have deducted a mark in our test for this. The power button is touch-sensitive and requires nothing more than a swiping your finger over the sensor to cycle through the brightness settings. 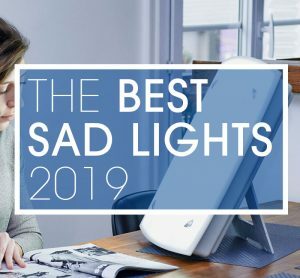 This lamp comes with the unit, power cord, and user manual that explains how to use the lamp, as well as holding useful information about light therapy and seasonal affective disorder. Out of the box, the lamp appears to be well-made. It is made of plastic and feels sturdy. I would not be afraid that this lamp would break if it fell off a table. There are 60 LEDs arranged in circular patterns across the surface of the lamp, behind a diffusing panel that helps to eliminate glare. Circadian optics offers one year-limited warranty with all their products which the minimum of all the lamps in our test and well behind other brands such as Alaska Northern lights and Northern Light Technologies, both of which offer a 7-year unlimited warranty. The Lampu works as advertised. It puts off 10,000 lux at 6 inches, though Circadian Optics notes that you should sit between 12 and 16 inches from the lamp. As with all these lights, it should be positioned in a way that it is pointed at your eyes but you are not looking directly into it. 10,000 Lux at 8 inches seems to be the standard for models around this size but this falls way below the top performers in our test like the Aurora LightPad Mini which puts out 10,000 lux at a distance of 24″ and as such this scores among the lowest on the performance test. The power button’s touch-sensitive design is intuitive, and I really enjoy how easy it is to just touch the sensor instead of pressing a button. The sensor is placed on the side and slightly behind the front panel and makes changing the setting very easy. The entire unit is very sturdy and put together well. There are small, round holes on the edges of the lamp for aesthetic purposes that let light out at certain angles, which can be slightly annoying. The tilt of the light panel cannot be changed. This lamp is a Full Spectrum lamp, and the light temperature is roughly 5500 K. The lights themselves are LEDs and will never need to be changed, as these types of lights boast a 50,000-hour lifespan. The light panel blocks 99.9% of UV light, so it is safe for your eyes and skin. 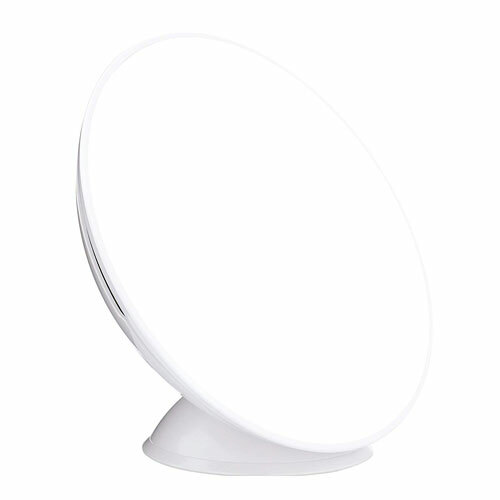 The lamp has a bold circular design that is pleasing to look at, with a circular light panel. The only color available is white with bright orange accents. It definitely appears cleaner and neater due to the use of curves in the design. The Lampu is larger than most of the other lamps Circadian Optics has on the market. It seems like a natural step up if you enjoyed using their other lamps. The diffusing pane works well and they have fixed the problems with the diffuser that the older versions seemed to suffer from. Because you need to be close to this lamp for effective treatment, It definitely takes some adjusting to achieve an angle that works without blinding you. 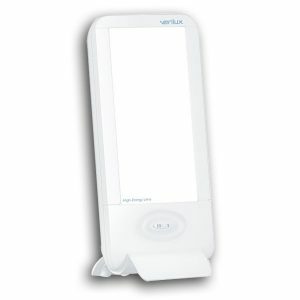 The 10,000 lux capability and circular light surface make for an effective treatment device. If you need a lamp that will fit into your home décor, this is probably the lamp you want to go with. 2019 MODEL UPGRADES | NO MORE DOTS - We have upgraded the light panel to emit a uniform, fully diffused light. IMPROVED ADAPTER - To further improve reliability and durability. (Released Feb 2019).